Soul Clap’s Charles Levine and Eli Goldstein know how the dancefloor works: if you catch the ladies the menfolk will also shacke a leg. With a well trained ear they blend easily old Jazz and Funk traditions with futuristic House rhythms. But thats not enough to set a club on fire. First of all their entertaining skills are dizzying. Instead of playing the cool dude behind the wheels of steel they are always ready to make a night of it and like to dance disguised even in the smallest DJ booth. 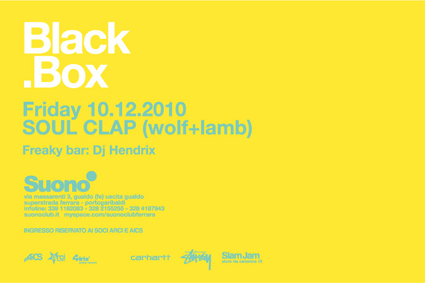 Tonight they perform during the Black Box night at the club Suono in Ferrara, Italy. Beside House and Techno they will definitely play some of their arresting edits that give old Soul and R&B tracks a fresh four-to-the-floor treatment. So be ready for a whale of a party. If you find yourself standing in the corner for longer then five minutes you sadly have to call yourself a party pooper.